To make a long story short, it's a fun chess game app for Windows 10 with more settings and options than you can shake a passed pawn at. There are two versions, a free version and an ad-free version priced at a couple dollars and change. I found the free version to be fine. The single ad displayed at the lower left of the screen has so far been unobtrusive and unobnoxious. If you later decide you do not want any ads, you can return to the Microsoft Store and have them removed for $2.49 (last time I checked). 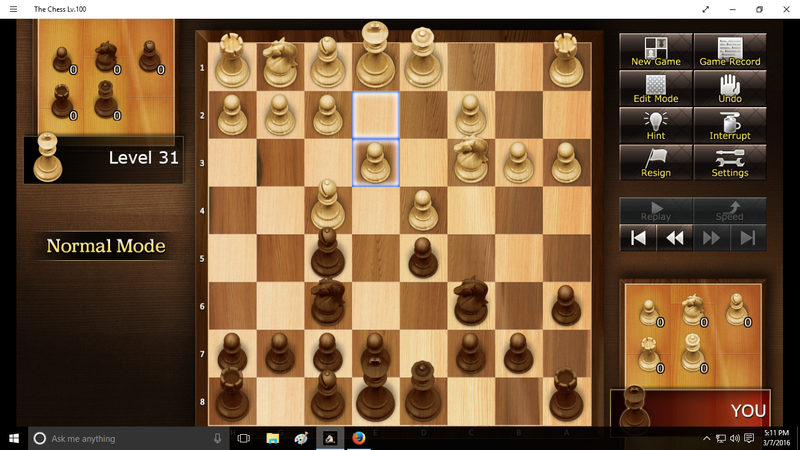 Side note: The Chess Lv.100 game app is available all over town, not just the Microsoft Store. The board and pieces are pleasant to look at and cause minimal or no eye strain. And while we are on the subject of eye strain, you show me any chess or other game with a bright white background and I will show you my rapidly departing shadow. Such games are murder on the eyes and you could very well pay the price 20 to 30 years down the road in the form of adult macular degeneration. As for all the settings and options, I still haven't discovered or figured them all out yet; haven't found much in the way of a help menu or instructions. It's kind of a trial and error sort of thing where you click whatever to see what happens and figure it out from there. During the game you can click the settings button for more options. 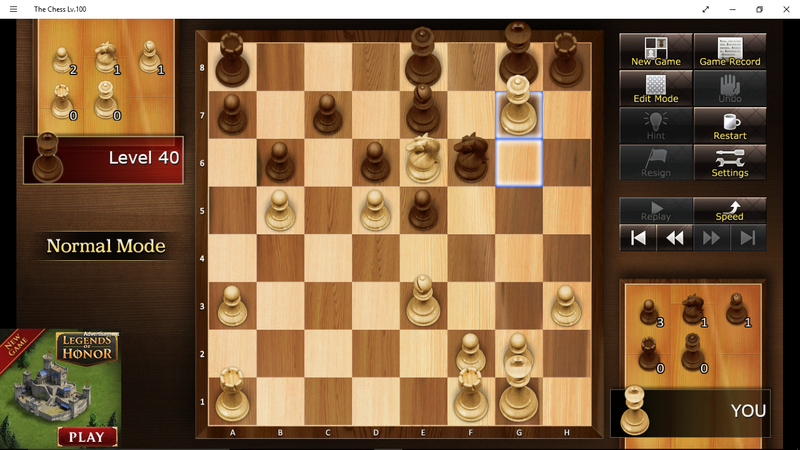 You can highlight the last move, legal moves, threats, etc. You can change the graphics and even tell it to play music. If the game makes a move where you are not sure what just happened, you do not need to click the Undo button. Click the back-arrows button to see what happened, then click the forward-arrows button when ready to resume the game. If you are quitting for the day and it's an unfinished game, simply close the app. When you reopen the app, the game will resume where you left off. Level 31 and it's definitely not rolling over and playing dead. This image is from the free version; you are not seeing the usual ad at lower-left below where it says "Normal Mode" because it was changing ads when I did the PrtScn. I'm having fun with it and plan to gradually work my way up the levels. I must win playing both black and white before I'll allow myself to move up to the next level. And I won't allow myself to undue blunders; already did a couple of those as a matter of fact, but managed to fight my way back and win. I consider it a virtual certainty it will be regularly shutting me down long before I get anywhere near level 100, but it's going to be fun getting to that point. If level 30 turns out to be a walk in the park and actually causes you to be bored, then a larger incrementation may indeed be in order; only you can decide. Personally, I haven't played in years and am rusty; after a few games I still haven't gotten that all-encompassing "flow" back yet. May all your chess games be stimulating, enlightening, and fun. I see that I posted the original review around six months ago. Just recently, a new ad function has been introduced. When you win a game, a full screen ad suddenly bursts upon the scene with full audio. Clicking the usual "x" makes it go away. Then you can still go back to the completed game to admire your handiwork, leastwise that's what I do. I'm rather proud of this one, though Level 40 isn't exactly a barnburner in the awesomeness department. It certainly made me work for it though. Once you are in the 40's range, the darned thing really makes one have to think. The good news is the game will still sometimes make opening moves that are downright insulting. The "bad" news is from that point forward, there are very few "gifts". If you overlook something or otherwise make a mistake, the game will immediately nail you for it. Also at this range level, the game plays somewhat aggressive offense as well as defense. One really does have to think ahead a few moves for the entire and every part of the board. Personally, now whenever I see a mess developing: I'll study it for awhile, then sign off for awhile; then sign back on after a few hours or even days and study it some more, then maybe sign off again. I might do this several times before finally making a move. Needless to say, my games have now turned into long term adventures. Totally fine with that and loving it. They've started using animated ads. Not good. They may have stopped with the animated ads. Leastwise there weren't any last time I was there. Animated ads still in play, but somehow not as obnoxious. Now they are doing announcement ads even when you lose. They are doing now doing motion ads and and constant ad changing. I have loved this game, but now there are the freezing problems. Or worse. Found a minor tech error. Rare, most players probably won't notice it. Meanwhile, continuing to enjoy the game. Still rating the game extremely positive. They don't do the full-page announcement ads when you resign; don't know if they do it when they checkmate you. And the last time I looked, the lower-left ad was innocuous. Meanwhile, I've noticed I've been doing this ongoing review for almost three years now; this app has certainly passed the test of time. Am still enjoying it and still happily giving the Chess Lv.100 Game App by Unbalance Corp a positive review and recommendation. The freezing problems I mentioned six months ago are long gone, just thought I'd mention that. does the undo function still work? I would like to know, how to switch sides in the middle of the game. I want to know why the computer didn't make another move besides the one it did. however the ads which appear on the bottom left of the screen seem to regularly cause the program to freeze for a minute or 2 each time. Frustrating when you want to move a piece and get on with the game. This inconvenience has only started to occur in more recent times.